This pasted January, there was movie that became a Sundance sensation. Something that buzzing from the annual film festival. A movie that cleverly subverts the title of an old movie that came out in 1915. The movie I am talking about is called "The Birth of A Nation." It tells the story of Nat Turner, a slave who orchestrated a slave rebellion in the heart of the 1800's south. The movie hit such a nerve at this years Sundance that Fox Searchlight payed a pretty penny for this to get released in theaters this October. People are going to say that Searchlight payed the big bucks out of the OscarsSoWhite controversy. People are predicting an Oscar Best Picture win already. I don't care about all of that, I am just so enthralled by the trailer I saw today. Its easily the best trailer of the year so far. Great editing, great set-up, great use of music. Pretty much great everything. 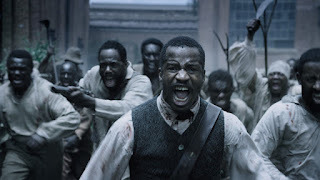 Nate Parker will star as Nat Turner and he also wrote and directed the movie. From what I've read, he poured his heart and soul and everything he had into making this movie. Why? Because he really wanted to tell the story of Nat Turner. Its pretty clear that award season was not on Parker's mind when he made this, and I think that's important to point out. This is something that is driven by passion, not Oscar bait. To me, it shows. Yep. Best trailer of the year so far. October can get here any minute now.